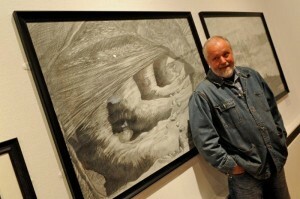 At the age of 14, artist Dave Gunning’s work was accepted into the royal academy. He has work in major collections all over the world and for the last 15 year has had his own Gallery that is run by his daughters in Ironbridge where he permanently exhibits his own work. Dave Gunning is a prolific artist and has had over 100 one man shows as well as over 50 joint exhibitions all over the world. A few publications to mention – Art in Parliament, The Permanent collection of the House of commons. Art in Wiltshire. Art and Artists. Principle works that the artist produced and continues to produce are thousands of large expressive drawings, many thousands of etchings ranging from small to extremely large to even larger plates that were exhibited as artwork in their own right. The artist also produced and continues to produce many hundreds of oil paintings.